This gem is not for sale, ladies and gentlemen -- you’ll have to make it your damn self. And luckily, it’s not too tricky. Essentially you make two grilled cheeses, glue them together with more cheese (I used a sharp cheddar because I was feeling snobby about American), and cut out that hole. 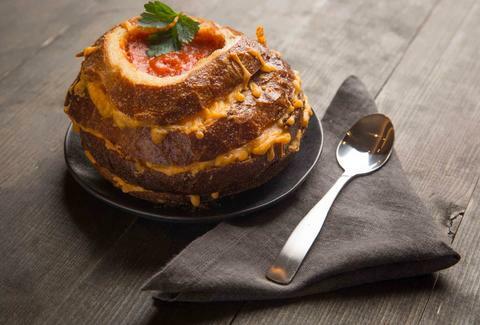 The negative space of the boule gets filled with hot, creamy tomato soup. 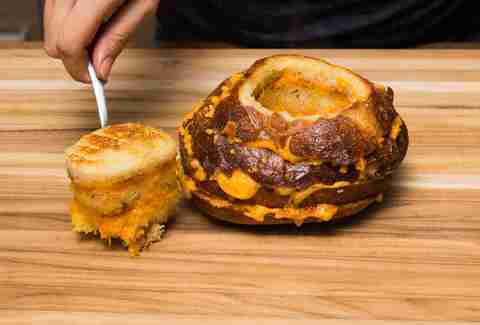 And the positive part of that hole becomes a bonus miniature grilled cheese for dipping. A positive, indeed. Slice off the tip of the boule and rid the world of it (or just eat it... maybe with a little butter and jam). Slice the rest of the boule into 1-inch rounds. Make sure the base is at least 1-inch thick, too. Keep the slices in order because you're going to need to put the boule back together. Arrange the slices on a griddle heated to medium (or just use a frying pan in shifts), keeping track of the layer order. Brush melted butter on the top of each slice. Flip them over and toast for 3-4 minutes, until golden. Meanwhile, butter the other sides. 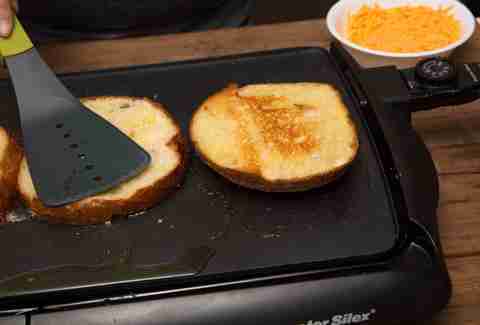 Flip the slices again and toast the other sides for 3-4 minutes. 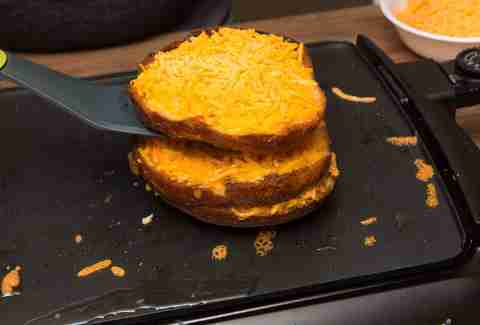 Cover each slice (except the smallest one) with shredded cheddar cheese. 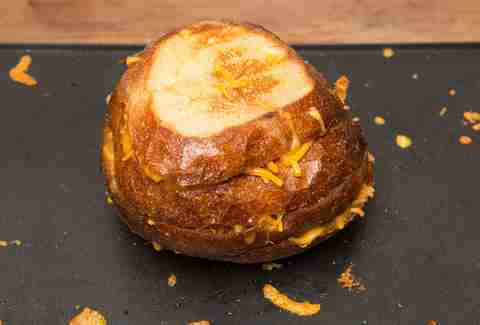 Once the cheese starts melting, stack the boule back together. Let the boule sit on the griddle for a few minutes for the layers to meld together. 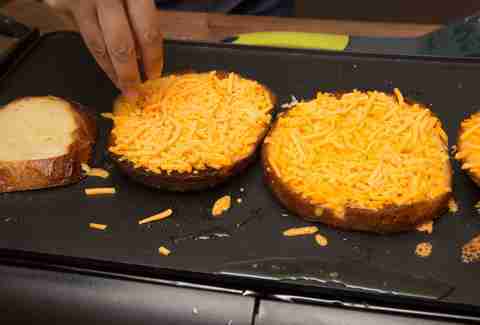 While you wait, snack on those crispy cheese bits fried to the griddle. 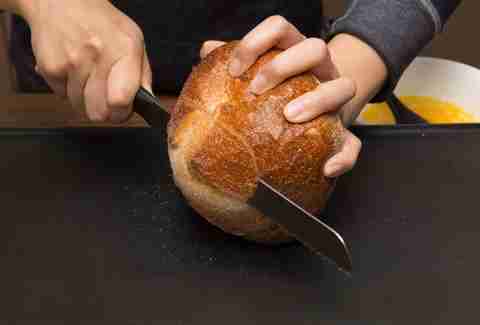 Use the knife to cut along the inside edge of the boule. You want to slice all the way down without actually puncturing the bottom. Use a large spoon to scoop the insides out in one piece. 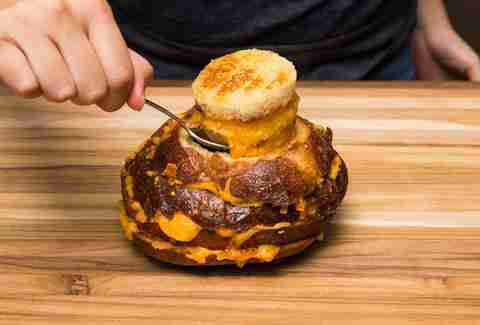 That's right, now you've got a mini grilled cheese to go with your gorgeous grilled cheese bread bowl. The only thing missing now is soup. Fill 'er up! Preheat a griddle to 350℉ or heat a large nonstick skillet over medium heat. 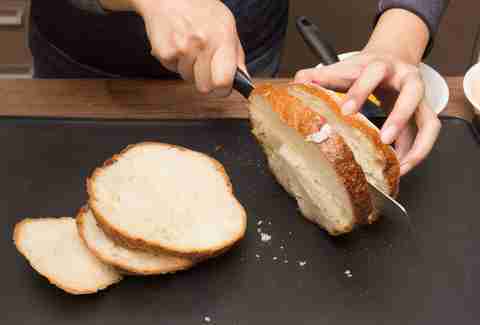 Using a serrated knife, slice top off boule; discard or eat. 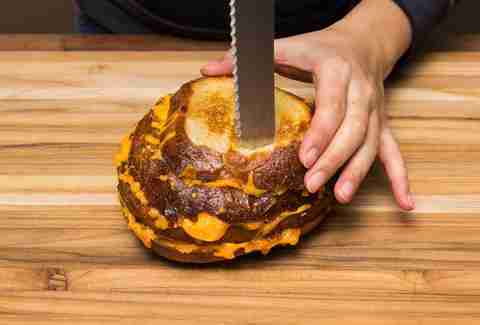 Slice boule horizontally into 1-inch rounds. Brush melted butter on each slice and place butter-side down on griddle. For the bottom slice, make sure this is the cut side. Brush butter on the tops of the slices while the bottoms brown, about 3-4 minutes. Flip slices and top each one, except the smallest (top) piece, with cheese. Once cheese melts, layer slices back in order on top of each other. Let it sit for 2-3 minutes on the griddle to meld together. Transfer the reconstructed boule to a plate and cut along the inside edge, all the way to the bottom, but not through it. Use a large spoon to scoop out the inside in one piece. 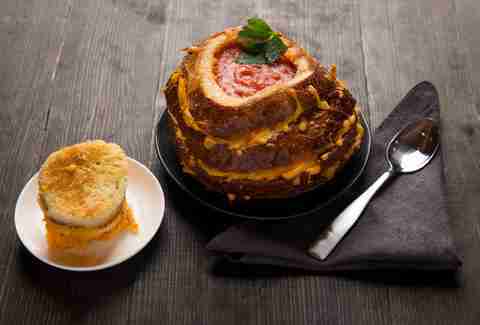 Fill the cavity with soup and serve with the mini grilled cheese.